The new SCARM version 1.0.0 is ready! Download it form www.scarm.info. Here are listed the most important new and improved features and updates in the milestone version. If “Check for Updates” feature in older releases reports that there is no newer version of SCARM, download the installer directly from the website. The old release info file may be cached on your PC and it may need some time to expire. If the website also shows older version, press F5 key to refresh it. This is the final and long awaited SCARM v. 1.0.0 release that completes the 7-year software developing cycle of the program’s core and main set of features. It comes with new and updated track libraries, packed in a new file format, rewritten routines for the grid and the rulers, allowing adjustable grid step in the settings, new option for over-bending of the flex tracks below the limits that are set in the libraries and several new options and features for the registered users of the program. Starting from this release, the unregistered version will be limited to work with up to 100 tracks and/or objects and 5 layers per project. 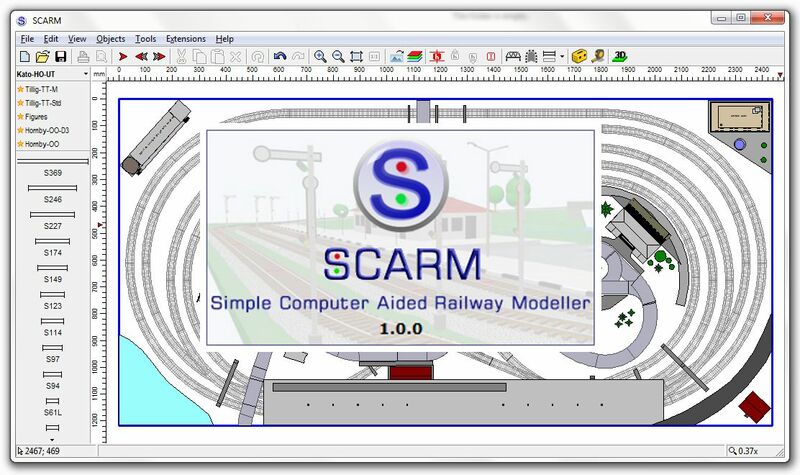 This will allow the free use of SCARM for small and some medium-sized track plans and layout designs. But if you want to unlock the full potential of the new version and to plan with unlimited number of tracks, objects and layers, you will need to buy SCARM license key. You will receive a free SCARM License Key per each MTS PE license that you have already purchased. Your license key will be available and activated in your account in the Registered Users Area. In order to install it in SCARM v. 1.x, login into your account, look for the “SCARM License Key (v1)” item in the table with the modules and left-click on the “Download” link to initiate the installation process. When prompted to install the license in SCARM, confirm the installation. Finally, restart SCARM and check the registration info in the “Help” > “About” dialog box. This version starts a new epoch in the development of SCARM. Get ready for many new functions and features that will come with the next updates and the future SCARM extensions! This entry was posted in General and tagged 1.0.0, milestone, new, release, update, version by Milen Peev - Author of SCARM. Bookmark the permalink. SCARM’s Lionel O-27 curve tracks do not match the Lionel O-27 curves I own. I’m currently working with a 42″ curve, as well as the standard 27″ radius. Your O-27 library does not include that 42″ curve. The Lionel O-27 library in SCARM has the 42″ curve – look for 65049 in the tracks selection panel. Note that Lionel lists O and O27 curves diameters, measured to the outer part of the ties, while SCARM measures the curve radius to the center line of the track.